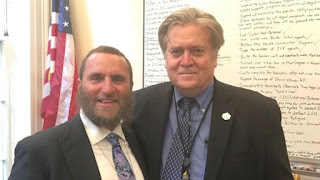 Though no bombshell secrets were revealed when visiting Rabbi Shmuley Boteach shared selfies taken with Dear Leader’s chief strategist and notable human hæmorrhoid posed before a whiteboard in a conference room of 1600 Pennsylvania Avenue that contained a long list of campaign pledges to make good on, such evidence, we believe, could still be an indictment of sorts by corroborating the regime’s breach of public trust or making the other branches of the US government subaltern to the will of the executive. In any case, do zoom in and scour these images, plus know it always behooves one to be aware of one’s backdrop. Perhaps that bit of workshopping wasn’t meant for public consumption.